Home » Reviews and Publicity » Three stars for RUNNER! Most recently, RUNNER was named a March Indie Next pick! RUNNER is the first in a new series starring retired special forces operative Sam Dryden. It's sold international rights in seven countries and the film rights were optioned by Warner Brothers with director Justin Lin (Fast & Furious 6) attached. It's one of Anne's personal favorites of the season and if you've heard her talk about it recently at book buzzes, then you know she's very vocal about her casting suggestion (Channing Tatum). PW: What was your inspiration for RUNNER and Sam Dryden? PL: The idea’s initial germ was a protagonist protecting a character who seems entirely vulnerable, but who may turn out to be very dangerous. Sam Dryden emerged as a balance between two things I was looking for in a main character: someone who’s ordinary, and yet is capable of dealing with fairly dangerous situations. So his background is military, including time spent doing things off-the-books that he’s not entirely proud of. But all of that is several years behind him when this series begins. PW: Why are your novels heavy on technology, à la Tom Clancy? PL: That grew out of my own interest in technology, and how quickly things are changing around us. I think it’s about 99% good (self-driving cars, potentially improved medical treatments because of genome sequencing) and maybe 1% bad (tech forecasters aren’t optimistic about the future of privacy). PW: How do you conduct your research? PL: Pretty often I just draw upon knowledge I’ve already encountered when reading for fun. I love reading nonfiction by writers like Jared Diamond, Richard Dawkins, and Carl Sagan. Bill Bryson is another favorite. PW: What did you base the mind control in RUNNER on? PL: The mind-control/mind-reading part is made up, but most of the technical dialogue about how DNA works is based on real science. I tried to make the concept feel plausible by comparing it to abilities that really exist in nature, like the capability of salamanders to regrow limbs. Some scientists think our own ancient ancestors, hundreds of millions of years ago, could regrow limbs, too, and that the DNA instructions for doing so might still exist in us, long-since switched off by more recent genes. I liked the idea of framing mind reading that same way: as a scary thing buried deep in the genetic toy box, which science has managed to dig out. PW: How close is RUNNER to becoming a movie? PL: Warner Brothers has bought the film rights. I should probably err on the side of caution as far as talking about it, but some of the people involved at this point are Pouya Shahbazian, Justin Lin, and Adam Cozad. I’m crossing all digits that can be crossed. 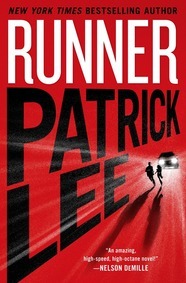 PL: The sequel to RUNNER, still untitled. It takes place a couple years after the events of RUNNER, and I probably shouldn’t reveal too much else. Plus I’m still writing it, so everything is subject to change. If you haven't read it yet, don't wait. Get whitelisted and download your review copy today. Then nominate it for LibraryReads (the deadline for the February list is January 1, 2014).